At COCO UP we are convinced that a company can expand and still stay true to it’s values. Since 2007, the start up continues to grow in a climate that respects the environment and also the people. Where quality, wellness, smiles and simplicity are priviledged. 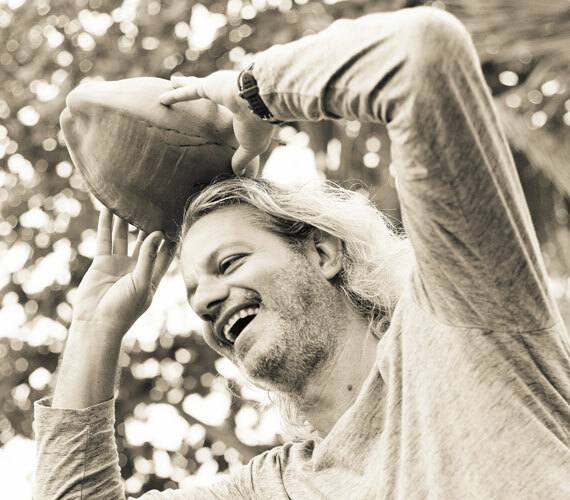 Arnaud Dalais was born in the saucepans of the family kitchen, and transformed his love for food into a passion for coconuts. His passionate nature as well as his creativity always involved innovating and shaking the coconut tree. His passion bought him to create COCO UP, the coconut artisan. In 2009 Arnaud bottled his first coconut water bottles with the help of his friend Louis. He sold them in a small village shop in Roches Noires on the north east of the island. Today, 6 years later COCO UP continues to grow and innovate. To bring real authentic products, to share and offer tailor made products. A new workshop will soon be open, the first coconut trees have been planted on their plantation and a new range of cosmetic products is being developped. At COCO UP we keep dreaming.